The Black Ryder have been making a great psychedelic noise for past few months that has culminated in their new album which will be their breakthrough moment. The Black Ryder have announced their new LP, ‘The Door Behind The Door’ which is due out on 24th Feb 2015. They like to perfectly describe themselves a s’rhinestone drone :: cinematique :: music to soothe your soul’ and are perfectly capturing that combination of tripped out blissful magic with ethereal drones The Black Ryder have perfectly made the most magical, hypnotic music. Formed in Australia, The Black Ryders debut album “Buy the Ticket, Take the Ride” was released in 2009 on their own label It was included in Rolling Stone Magazine (Australia) Best Albums of 2010. 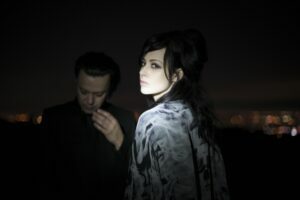 The Black Ryder were also nominated Best New Artist and they relocated to Los Angeles where one of the core duo of the band along with, Scott Von Ryper, Aimee Nash married mate of LTW the great Ian Astbury. They sound like the greatest band that Creation never released in their golden period and their blissful tripped out indie perfection is quite magical.